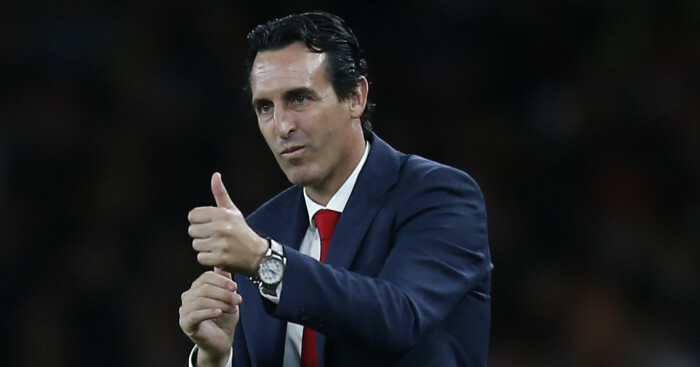 Arsenal are still waiting for a first statement win of the Unai Emery era, but the progress made by the Spaniard in his first three months in charge was clear to see as Liverpool left the Emirates content with a point from Saturday's thrilling 1-1 draw. Despite a 14-game unbeaten run in all competitions, the Gunners remain four points off Liverpool at the top of the Premier League table and will end the weekend outside the top four courtesy of North London rivals' Tottenham's 3-2 win at Wolves. But much has changed since the opening day of the season when reigning champions Manchester City outclassed Arsenal on Emery's first chance to make an impression as the man to succeed Arsene Wenger's 22-year reign in charge. That sunny August afternoon the home fans bristled at the sight of veteran goalkeeper Petr Cech struggle to come to terms with the former Paris Saint-Germain coach's instructions to play out from the back. "The spirit is like we want and also the atmosphere today was a very big atmosphere with the supporters pushing for 90 minutes," said Emery. Summer signing Bernd Leno has since replaced Cech as number one and shown he is far more adept with the ball at his feet as Arsenal moved the ball smoothly upfield despite facing the famed 'gegenpressing' that characterises Jurgen Klopp's Liverpool. "The manager has a new philosophy. Many things changed, because ArsSne Wenger was here for a long time," said Leno. "It was clear we needed time but like you saw today, the movement and the confidence of the players is always getting better. "Today we controlled the game against a big club, against big players." In midfield Lucas Torreira had to wait until late September for his first league start. But the Uruguayan international is the type of player Arsenal lacked in the final years of Wenger's reign. Already his mixture of tough tackling and passing ability in possession has made him a fans' favourite. And up front it was Lacazette, who started the season playing second fiddle to Pierre-Emerick Aubameyang from the bench, who repaid Emery's faith for keeping him on the field and sacrificing Aubameyang with his substitutions in the search for an equaliser. "We felt we had the quality to play (against) the top of the league tonight," said Lacazette. Even Emery admitted Arsenal are far from the finished article, even citing Liverpool's gradual improvement in three years under Klopp as an example to follow.